It’s hard to believe we’re moving into the holiday season. Before all the hurry and rushing about this season, perhaps you would enjoy a lovely, relaxing weekend at one of our Finger Lakes vacation rentals in Skaneateles. Most of our properties are within walking distance of the village and offer a unique, relaxing experience. Unlike standard motels, hotels and other places to stay in the Finger Lakes, our meticulously maintained properties give you plenty of room to stretch out and get comfy for your stay here. All our properties can be accessed on our Properties page. We are excited to offer you 10 private homes to choose from. Whether you need a vacation rental for a whole family and guests, or simple a weekend getaway, there is a perfect location just for you. Need a large Finger Lakes vacation rental? Check out this one on Wave Way!! This one of a kind, luxurious 2900 square foot ranch home is nestled on the west side of beautiful Skaneateles Lake. This home was completely renovated top to bottom in 2013. Every inch of this home is brand new including brand new furnishings. It has been professionally interior designed in a comfortable, refined cottage style. It is located across from famed Anyela’s Winery, two miles from Country Club, and only a five minute drive from downtown Skaneateles. The beautiful sunrises from the deck are absolutely magnificent! There are also two docks, a mooring buoy and over 100 feet of private lakefront for you to enjoy. The spacious backyard has a fire pit and is entirely fenced in. On the main level there is a spacious living room with fire place and cathedral ceilings, kitchen including a wet/bar coffee station, two large bedrooms (both with kings). On the lower level there is another spacious living room with fire place, kitchenette/wet bar/coffee station and there are two more beautiful bedrooms with lake views (one bedroom has two sets of full size bunk beds and the other is a beautiful master bedroom suite with a king and en suite bathroom) and there is also a second guest bathroom. This newly constructed buildings is one of the oldest, most historic building in all of Skaneateles. The former Skaneateles Village municipal building, now known as Knabb Hall, is one of the most unique and beautiful lakefront properties in all of Skaneateles. If you ever imagined vacationing on your own private lakefront oasis right in downtown Skaneateles, this property is the one for you! This amazing lakefront property is one of two brand new properties located in Knabb Hall and offers 1200 square feet of living space, two bedrooms, two full bathrooms, a deck with beautiful southern views of Skaneateles Lake, an elevator, and most importantly, 25 feet of lakefront in the heart of downtown Skaneateles. This newly built property is located right on the main level of historic Knabb Hall. It has a beautiful open floor plan with beautiful southern views of Skaneateles Lake. 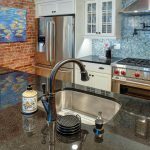 The kitchen has granite counters, island with seating for three people, and high end appliances including a wolf stove perfect for entertaining. There is also a dining area with additional seating for six people. The spacious living room has gorgeous southern lake views, comfortable seating along with a sleeper sofa, and a 46 inch high definition television. The master bedroom has a king sized bed, en suite master bathroom with shower, granite counters, and spacious closet. The guest bedroom has beautiful southern lake views and the guest bathroom has beautiful granite counters and a tub shower. When you are looking for places to stay in the Finger Lakes, remember that Skaneateles Lake and Village are bustling with activity all year round. With some of the most unique shops, 5-star restaurants, lake activities, quaint buildings and village atmosphere, this is truly one of the most sought after vacation locations. Finger Lakes vacation rentals offer you the most memorable getaway for couples and entire families. With the holiday season fast approaching, this would be a wonderful gift to your family to entertain for Thanksgiving or Christmas in one of our luxury rentals. Imagine having the space to entertain, have guests stay with you overnight or for a weekend, and enjoy the holidays with plenty of room to relax!